We will break down the top five studio monitor speakers, helping you to find the best one for your needs. Our list includes studio monitors for both professionals and hobbyists alike. Without further ado, here are the best studio monitors in 2019. The KRK Rokit 5 is an excellent all-around studio monitor. KRK has an great track record when it comes to studio monitors, subwoofers, and headphones and the Rokit 5s are no exception. The sound quality is excellent for the price, and the included stands are a huge plus. The Rokit 5s sound quality is excellent, even compared to higher priced studio monitors. The 5-inch midrange driver produces clear distortion free sound. You will listen to your music exactly how it was meant to be heard. Unless your music is bass heavy. These studio monitors don’t have lousy bass, but the bass isn’t as crisp at higher volumes. This isn’t unusual, small speakers typically have weaker bass. Not a problem for those looking for an entry-level system. The included stands get the job done most people won’t find an upgrade necessary. The front-facing bass port is a great feature for home studios. Most studio monitors are designed with the bass port in the back. KRK designed these with your home studio in mind. If your studio is cramped, you might place the monitors against the wall, on regular speakers, this would hurt the sound quality. With a front bass port, the sound is projected out and not muffled against the wall. Overall these are great for producers looking to make a studio at home. The sound is also clear and loud enough for house parties, or for listening to music while cleaning. Producers will be happy with the overall design and quality of these speakers. The price for both speakers and two stands is insanely low. These are just a few reasons why the KRK Rokit 5 is the best studio monitor of 2019. If you are a producer looking to graduate from a pair of cheap studio monitors the Neumann KH 120 is a great option. They are pricey, but the quality is worth it. The speaker is constructed with bi-amped 50W+50W watt amplifiers. The sleek metal design is just another symbol of Neumann quality. The dimensions of the Neumann are 16.5 x 11.1 x 14.3 in. They weigh 17.5 pounds each. Don’t let their size fool you, they pack a big punch for such a small monitor. Neumann has included their patented Mathematically Modeled Dispersion waveguide. The waveguide maintains an even and precise sound quality off and on axis in order to try and reduce the effects of studio monitor placement. The bass produced by the KH 120s is jaw-dropping. The four-position bass and long throw bass driver will make every bass head happy. 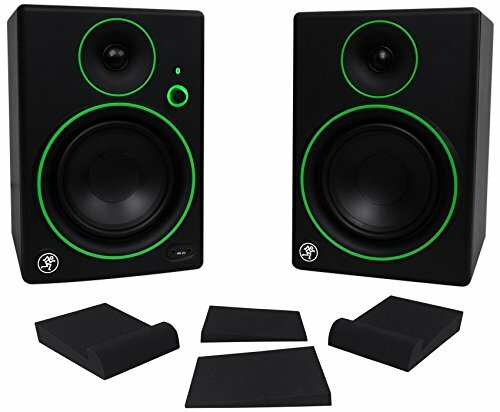 These speakers are great for large or small studios, but you will need to buy stands separately. Neumann has outdone themselves with the KH 120. No other speaker offers crisp sound and a booming bass in such a small package. These will be great for post-production, mixing, and mastering. If production isn’t your main job, and you need a multipurpose studio speaker, you’re in luck! 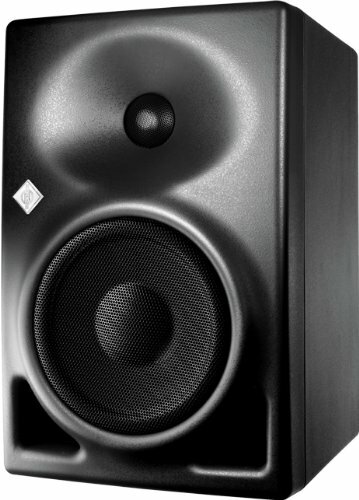 The Mackie CR5BT’s are a great versatile studio speaker. Listen while mixing your music or hook them up to your PC for an immersive gaming experience. These five-inch speakers cost a little but do a lot. The build quality is good. It’s not as well made as the Neumann KH 10 or the KRK Rokit 5, but it isn’t going to fall apart either. The CR5BT has Bluetooth built in. So, you can connect your device without relying on a cord. These speakers will be a significant upgrade from a normal Bluetooth speaker set up, and they don’t cost much more either. Mackie makes great products, but the CR5BT does have some compromises. For example, the bottom does not have a place for a speaker stand. If you are looking to mount these speakers, you will have to use shelves or some other mounting option. 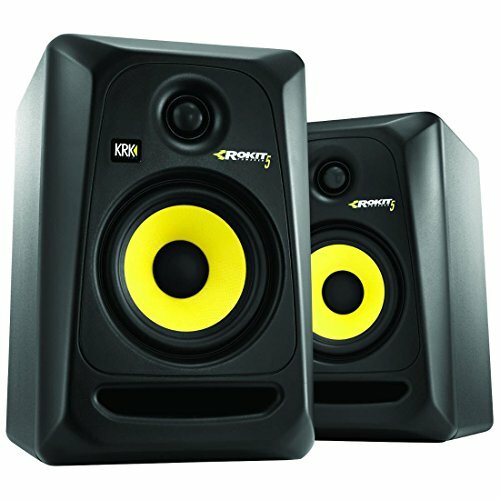 Overall, these are great studio monitors. If you are currently using a cheap Bluetooth system, these are a significant upgrade. The price is reasonable, but the lack of stands isn’t ideal for a studio. If you are primarily a gamer and music production is a side hobby the CR5BT is a good system. The Vault C5 has two powered speakers. The two monitors are great for critiquing low and mid-range music. Two long cables and two foam pads are also included. And to keep your walls from falling down from the boom of the C5, a room control feature has been added. The team at Vault has gone the extra mile for those with roommates! Silk dome tweeters help this monitor create clear vocals. The C5 is also pushing 70 watts through its built-in amp, so the bass is clear too. A quality system for producers getting started. The sound will fill a small home studio easily. The vault C5 has two bigger brothers, the C6 and C8. These models pack even more bass than the C5. If you need to fill a medium or large room, these monitors will help you do it. The Rockville APM5B comes in four sizes. The five-inch speakers are good for hobbyists. The six and eight-inch speakers will give you a bit more power, while the ten-inch speaker will blow you out of the water. All three sizes have excellent construction and sound quality. What makes the APM5B stand out is the quality control. Rockville doesn’t sell their speakers without testing them. If they pass the test, they are shipped and if not they are scrapped. 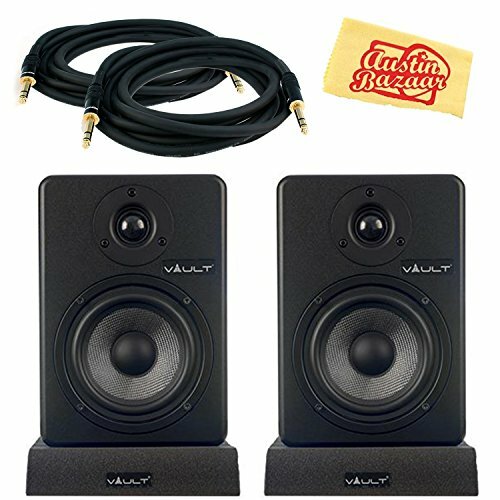 When you buy these studio monitors, you won’t need to worry about getting a broken product. The speakers come in a pair with no stands. Stands can be easily added. The APM5B is a bi-amped studio monitor. Each speaker has an amp for lows and highs. The wood construction pairs nicely with the dual amps and creates a great sound experience. Again, Rockville doesn’t skimp on quality. The wood is a solid one inch thick making it easy to fill your studio with high-quality sound. The speakers come in three colors wood grain, black, and white. These studio monitors will compliment any setting. Mount them on stands for the best performance, but they’ll look good on a shelf too. When looking for the best studio monitor the first step is picking a price range. 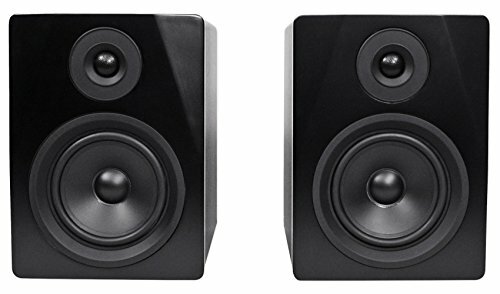 Studio monitors can be under $100 or over $1000. A low-end studio monitor isn’t going to offer the same experience as higher end models. If you are considering music production as a career, you’ll want to get a mid to high range model. A hobbyist will want a low end and multipurpose studio monitor. Next, look at the brands. Some brands have excellent reputations, and some are peddling Chinese knockoffs. Just because you paid a grand doesn’t mean you bought from a good brand. A reputable brand’s low-end studio monitor will outperform a lousy brand’s high-end option. Finally, make sure your chosen speakers have an adequate frequency range. Look for options that are at least in the 50hz on the low side of the range for the best sound quality. Also pay attention to near, mid, and far-field designs. A large studio will need mid- or far-field speakers. Home studios will be fine with near-field speakers. What makes a studio monitor different? Studio monitors are designed to offer the most precise sound possible. They are used to produce music and other kinds of audio. They allow you to hear music exactly how it was created. So, ideally, you will have little to no distortion. A surround system is excellent for movies and television. A studio monitor is meant for creating media. Some systems offer both capabilities, but they are generally lower end models. Studio monitors typical offer a multitude of input options. Bluetooth is great for compressed music, but unmixed tracks need to be transferred to the old fashion way. Sound professionals from all backgrounds use studio monitors. The audio in movies and television shows was crafted by someone using a studio monitor. Your favorite musician has them in their studio. Even radio shows use studio monitors. Producers use them because of their design. Regular speakers are designed to play compressed music for consumers. Studio monitors are designed to play sounds of every frequency. Sudden transitions and subtle notes are more accessible to pick up when using these speakers. Hobbyist also use studio monitors. Prices have gone down making it easier for people to make their own music. While not the same as the speakers used by professionals they still offer a superior sound quality than cheap Bluetooth speakers. Why can’t I use my surround sound system? Surround sound systems are great for entertainment. However, you wouldn’t use a hammer when the job calls for a screwdriver. Studio speakers produce a flat frequency, making it easy for producers to analyze their audio. They are also designed to withstand falls, drops, and other accidents. Surround sound systems don’t offer built-in amplifiers either. If you try to play music too loud on a surround sound system, you risk blowing a speaker. Studio monitors are designed to withstand the loudest music you can think of. They are also mounted on stands so you can quickly move them. Consider your needs. Are you looking to produce, entertain, or have fun? Producers will need a studio quality sound. If you are throwing parties or hosting events, a low-end model could be helpful. The durability and the high volume makes them ideal for big games. If you are just having fun look at low to mid-range speakers. You don’t want to buy a pair and then realize your hobby is now bringing in money. It’s always better to buy quality once than a cheap product twice. Set a price range. Make sure you can afford the system you want. Don’t settle for a cheap speaker set. Keep in mind what kind of music you are making and buy a speaker recommended by producers in that genre. Brand names are ideal. Do some research on the brands you are looking at and make sure they have a good track record. Buying a brand name form Amazon is a great option since you will get double the customer service. Buy from brands with a rich history and good reviews.